Sea-level rise (SLR) poses a particularly ominous threat because 10% of the world’s population (634 million people) lives in low-lying coastal regions within 10 m elevation of sea level (McGranahan et al. 2007). Much of this population resides in portions of 17 of the world’s 30 largest cities, including Mumbai, India; Shanghai, China; Jakarta, Indonesia; Bangkok, Thailand; London; and New York. In the last article – Sinking Megacities – we saw that some of these cities are sinking due to ground water depletion. To those megacities, this is a much more serious threat than global sea level rise (probably why we see so many marches and protests about ground water depletion). ..The potential loss of life in low-lying areas is even more graphically illustrated by the 1970 Bhola cyclone that traveled northward through the Bay of Bengal producing a 12-m-high wall of water that drowned a half million people in East Pakistan (now Bangladesh) (Garrison 2005). 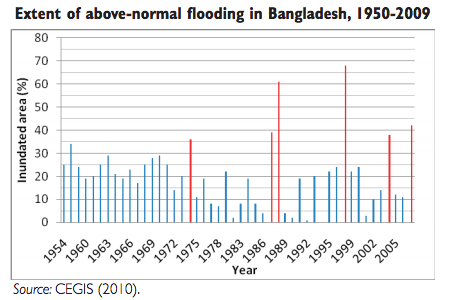 In an average year, nearly one quarter of Bangladesh is inundated, with more than three-fifths of land area at risk of floods of varying intensity (Ahmed and Mirza 2000). Every four or five years, a severe flood occurs during the monsoon season, submerging more than three-fifths of the land.. The most recent exceptional flood, which occurred in 2007, inundated 62,300 km² or 42 percent of total land area, causing 1,110 deaths and affecting 14 million people; 2.1 million ha of standing crop land were submerged, 85,000 houses completely destroyed, and 31,533 km of roads damaged. Estimated asset losses from this one event totaled US$1.1 billion (BWDB 2007). 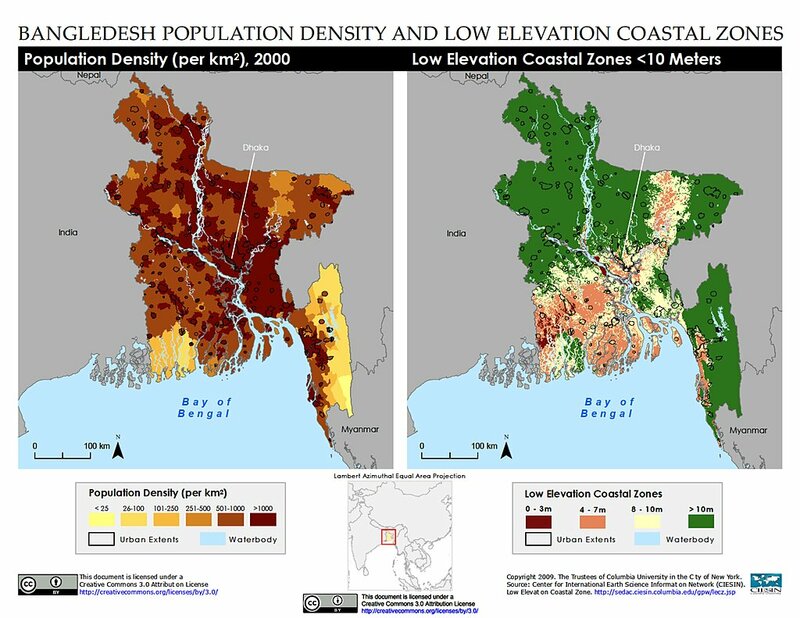 Flooding in Bangladesh results from a complex set of factors, key among which are extremely low and flat topography, uncertain transboundary flow, heavy monsoon rainfall, and high vulnerability to tidal waves and congested drainage channels. Two-thirds of Bangladesh’s land area is less than 5 m above sea level. Each year, an average flow of 1,350 billion m³ of water from the GBM [Ganges, Brahmaputra, and Meghna] basin drains through the country. I recommend this World Bank report, very interesting, and you can see some idea of the costs of mitigating against floods. These problems are already present – floods are a regular occurrence, some mitigation has already taken place, and more mitigation continues. Increase in ocean surface temperature and rising sea levels are likely to intensify cyclonic storm surges and further increase the depth and extent of storm surge induced coastal inundation. However, the projections indicate that sea level rise is much less of a problem compared with possible increases in future storm surges and possible increases in future flooding. And compared with current storm surges and current flooding. We will look at floods and storm surges in future articles. In the report it’s clear that floods and storms are already major problems. Sea level is harder to analyze. Trying to account for a sea level rise of 0.3m by 2050 when severe storm surges are already 5-10m is not going to make much of a difference. If we had accurate prediction of storm surges, to +/- 0.3m, then sea level rise of 0.3m should definitely be accounted for. But we don’t have anything like that kind of accuracy. Under the baseline scenario, the adaptation costs total $2.46 billion. In a changing climate, the additional adaptation cost totals US$892 million. In essence the question is “what is the storm surge for a once in a 10 year storm in 2050”? (I’m sure Bangladesh would really prefer to build protection against a once in 100 year storm). An extra $1bn for future problems, or a total of $3.5bn to cover existing and future problems, seems like money that would be very well spent, representing excellent value. Many impact studies do not consider adaptation, and hence determine worst-case impacts. Yet, the history of the human relationship with the coast is one of an increasing capacity to adapt to adverse change. In addition, the world’s populated coasts became increasingly managed and engineered over the 20th century. The subsiding cities discussed above all remain protected to date, despite large relative SLR. Analysis based on benefit-cost methods show that protection would be widespread as well-populated coastal areas have a high value and actual impacts would only be a small fraction of the potential impacts, even assuming high-SLR (>1 m/century) scenarios. This suggests that the common assumption of a widespread forced retreat from the shore in the face of SLR is not inevitable. In many densely populated coastal areas, communities advanced the coast seaward via land claim owing to the high value of land (e.g., Singapore). Yet, protection often attracts new development in low lying areas, which may not be desirable, and coastal defense failures have occurred, such as New Orleans in 2005. Hence, we must choose between protection, accommodation, and planned retreat adaptation options. This choice is both technical and sociopolitical, addressing which measures are desirable, affordable, and sustainable in the long term. Adaptation remains a major uncertainty concerning the actual impacts of SLR. As a cautionary note, it should be noted that this analysis did not address the out-migration from coastal zones that a rise in sea level and intensified cyclonic storm surges might induce. In fact the cost data assumes population growth in the vulnerable regions. Coastal flood damages are expected to increase significantly during the 21st century as sea levels rise and socioeconomic development increases the number of people and value of assets in the coastal floodplain. This assumption bias creates an interpretation challenge. It would be useful to see notes to the effect: “If the population migrates away from this area due to the higher risk, instead the cost will be $X assuming a reduction of Y% in population in this region by 2050“. This extra item of data would create a useful contrast and I’m guessing that we would see impact assessments reduce by a factor of 5 or 10. It is difficult to see realistic global sea level changes, even to the end of the century, having a big impact on Bangladesh compared with their current problems of annual flooding and frequent large storm surges. Of course, adding an extra 0.5m to the sea level doesn’t improve the situation, but it is an order of magnitude smaller than storm surges. The adaption costs estimated by the World Bank to protect against storm surges (already required but at least a work in progress) seem moderate in value. I have to admit that I believed something like 25% of the Bangladesh population were around 1.0m or less above current sea level. This map says that the 0-3m area is quite small. If anyone does have a better resolution map I will post it up. Probably the provocative way I wrote the conclusion confused some people. I should have said that it was a very expensive problem. But that it wasn’t a problem that society should pay for, given that anyone moving to the coast since 2005 at the latest would have known that future sea level was considered to be a major problem. By 2100 the youngest people still living right on the sea front, who bought property there before 2005, would be at least 115 years old. The idea is that “externalities” as economists call them should be paid by the creators of the problem, not the people that incur the problem. In this case, the “victims” are people who ignored the evidence and moved to the coast anyway. Are they still victims? That was my point. Well, what about outside the US? Coastal areas constitute important habitats, and they contain a large and growing population, much of it located in economic centers such as London, New York, Tokyo, Shanghai, Mumbai, and Lagos. The range of coastal hazards includes climate-induced sea level rise, a long-term threat that demands broad response. Global sea levels rose 17 cm through the twentieth century, and are likely to rise more rapidly through the twenty-first century when a rise of more than 1 m is possible. (2) widespread human-induced subsidence due to ground fluid withdrawal from, and drainage of, susceptible soils, especially in deltas. Over the twentieth century, the parts of Tokyo and Osaka built on deltaic areas subsided up to 5 m and 3 m, respectively, a large part of Shanghai subsided up to 3 m, and Bangkok subsided up to 2 m.
This human-induced subsidence can be mitigated by stopping shallow, subsurface fluid withdrawals and managing water levels, but natural “background” rates of subsidence will continue, and RSLR will still exceed global trends in these areas. A combination of policies to mitigate subsidence has been instituted in the four delta cities mentioned above, combined with improved flood defenses and pumped drainage systems designed to avoid submergence and/ or frequent flooding. In contrast, Jakarta and Metro Manila are subsiding significantly, with maximum subsidence of 4 m and 1 m to date, respectively (e.g., Rodolfo and Siringan, 2006; Ward et al., 2011), but little systematic policy response is in place in either city, and future flooding problems are anticipated. To put these figures in context, sea level rise from 1900-2000 was about 0.2m and according to the latest IPCC report the forecast of sea level rise by 2100 might be around an additional 0.5m (for RCP 6.0, see earlier article). In the light of the idea that global society should pay for problems to people caused by global society, perhaps the problems of Shanghai, Bangkok and other sinking cities are not global problems? Shanghai is low-lying, with an elevation of 3–4 m. A quarter of the area lies below 3 m. The city’s flood-control walls are currently more than 6 m high. However, given the trend of sea level rise and land subsidence, this is inadequate. Shanghai is frequently affected by extreme tropical storm surges. The risk of flooding from overtopping is considerable..
..From 1921 to 1965, the average cumulative subsidence of the city center was 1.76 m, with a maximum of 2.63 m. From 1966 to 1985, a monitoring network was established and subsidence was mitigated through artificial recharge. Land subsidence was stabilized at an average of 0.9 mm/year. As a result of rapid urban development and large-scale construction projects between 1986 and 1997, subsidence of the downtown area increased rapidly, at an average rate of 10.2 mm/year.. ..In 2100, sea level rise and land subsidence will be far greater than before. Sea level rise is estimated to be 43 cm, while land subsidence is estimated to be 3–229 cm, and neotectonic subsidence is estimated to be 14 cm. Flooding will be severe in 2100 (Fig. 8). [Note I changed the data in the last paragraph cited to round numbers in cm from their values quoted to 0.01cm – for example, 43cm instead of the paper’s values of 43.31 etc]. So for Shanghai at least global sea level rise is not really the problem. Given that I don’t pay much attention to media outlets I probably missed the big Marches against Ground Water Depletion Slightly Accentuating Global Warming’s Sea Level Rise in Threatened Megacities. As with the USA data the question of increased storm surges accentuating global sea level rise is still on the agenda (i.e., has not yet been discussed). 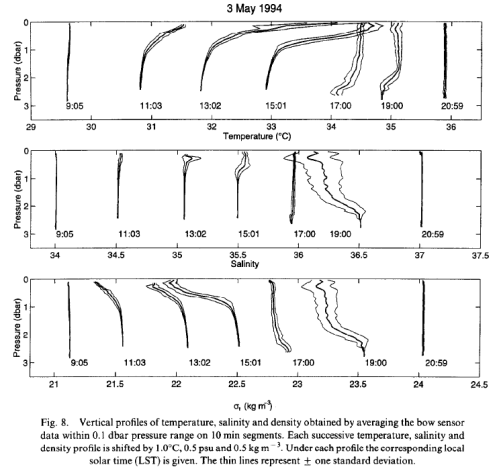 In Thirteen – Terminator II we had a cursory look at the different “proxies” for temperature and ice volume/sea level. And we’ve considered some issues around dating of proxies. Now we want to take a closer look at the proxies themselves. It’s a necessary subject if we want to understand ice ages, because the proxies don’t actually measure what they might be assumed to measure. This is a separate issue from the dating: of ice; of gas trapped in ice; and of sediments in deep ocean cores. There is another significant water isotope, Deuterium – aka, “heavy hydrogen” – where the water molecule is HDO, also written as 1H2HO – instead of H2O. The processes that affect ratios of HDO are similar to the processes that affect the ratios of H218O, and consequently either isotope ratio can provide a temperature proxy for ice cores. A value of δD equates, very roughly, to 10x a value of δ18O, so mentally you can use this ratio to convert from δ18O to δD (see note 1). In Note 2 I’ve included some comments on the Dole effect, which is the relationship between the ocean isotopic composition and the atmospheric oxygen isotopic composition. It isn’t directly relevant to the discussion of proxies here, because the ocean is the massive reservoir of 18O and the amount in the atmosphere is very small in comparison (1/1000). However, it might be of interest to some readers and we will return to the atmospheric value later when looking at dating of Antarctic ice cores. The isotope ratio, δ18O, of ocean water = 2.005 ‰, that is, 0.205 %. This is turned into a reference, known as Vienna Standard Mean Ocean Water. So with respect to VSMOW, δ18O, of ocean water = 0. It’s just a definition. The change is shown as δ, the Greek symbol for delta, very commonly used in maths and physics to mean “change”. The values of isotopes are usually expressed in terms of changes from the norm, that is, from the absolute standard. And because the changes are quite small they are expressed as parts per thousand = per mil = ‰, instead of percent, %. So as δ18O changes from 0 (ocean water) to -50‰ (typically the lowest value of ice in Antarctica), the proportion of 18O goes from 0.20% (2.0‰) to 0.19% (1.9‰). If the terminology is confusing think of the above example as a 5% change. What is 5% of 20? Answer is 1; and 20 – 1 = 19. So the above example just says if we reduce the small amount, 2 parts per thousand of 18O by 5% we end up with 1.9 parts per thousand. 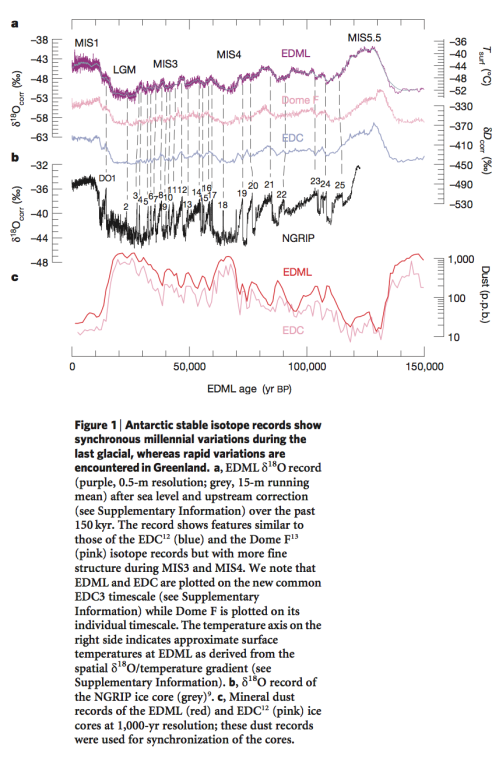 Note that the values of δ18O from Antarctica (EDML – top line) through the last 150 kyrs are from about -40 to -52 ‰. And the values from Greenland (NGRIP – black line in middle section) are from about -32 to -44 ‰. There are some standard explanations around – like this link – but the I’m not sure the graphic alone quite explains it – unless you understand the subject already.. If we measure the 18O concentration of a body of water, then we measure the 18O concentration of the water vapor above it, we find that the water vapor value has 18O at about -10 ‰ compared with the body of water. We write this as δ18O = -10 ‰. That is, the water vapor is a little lighter, isotopically speaking, than the ocean water. So let’s consider the journey of a parcel of water vapor evaporated somewhere near the equator. The water vapor is a little reduced in 18O (compared with the ocean) due to the evaporation process. As the parcel of air travels away from the equator it rises and cools and some of the water vapor condenses. The initial rain takes proportionately more 18O than is in the parcel – so the parcel of air gets depleted in 18O. It keeps moving away from the equator, the air gets progressively colder, it keeps raining out, and the further it goes the less the proportion of 18O remains in the parcel of air. By the time precipitation forms in polar regions the water or ice is very light isotopically, that is, δ18O is the most negative it can get. As a very simplistic idea of water vapor transport, this explains why the ice sheets in Greenland and Antarctica have isotopic values that are very low in 18O. Let’s take a look at some data to see how well such a simplistic idea holds up..
We can see the broad result represented quite well – the further we are in the direction of the poles the lower the isotopic composition of precipitation. 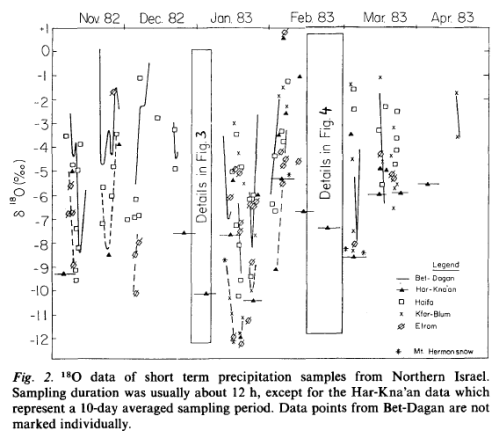 It is quite surprising that the seasonally averaged isotopic composition of precipitation converges to a rather well-defined value, in spite of the large differences in the δ value of the individual precipitation events which show a range of 12‰ in δ18O.. At Bet-Dagan.. from which we have a long history.. the amount weighted annual average is δ18O = 5.07 ‰ ± 0.62 ‰ for the 19 year period of 1965-86. Indeed the scatter of ± 0.6‰ in the 19-year long series is to a significant degree the result of a 4-year period with lower δ values, namely the years 1971-75 when the averaged values were δ18O = 5.7 ‰ ± 0.2 ‰. That period was one of worldwide climate anomalies. Evidently the synoptic pattern associated with the precipitation events controls both the mean isotopic values of the precipitation and its variability. As pointed out.. one cannot use the composition of the individual rain as a direct measure of the condensation temperature. Nevertheless, it has been possible to show a simple linear correlation between the annual mean values of the surface temperature and the δ18O content in high latitude, non-continental precipitation. The main reason is that the scattering of the individual precipitation compositions, caused by the influence of numerous meteorological parameters, is smoothed out when comparing average compositions at various locations over a sufficiently long period of time (a whole number of years). 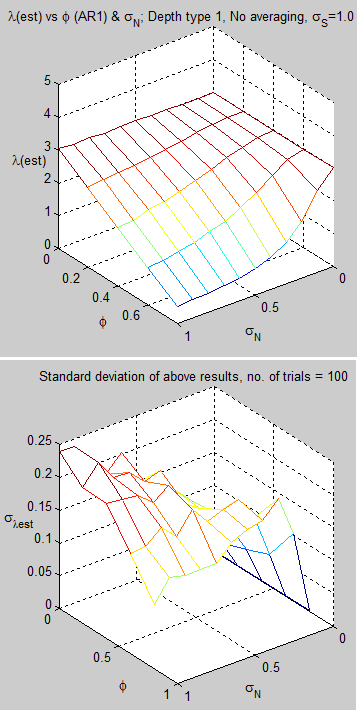 The somewhat revised and extended correlation is shown in fig. 3.. 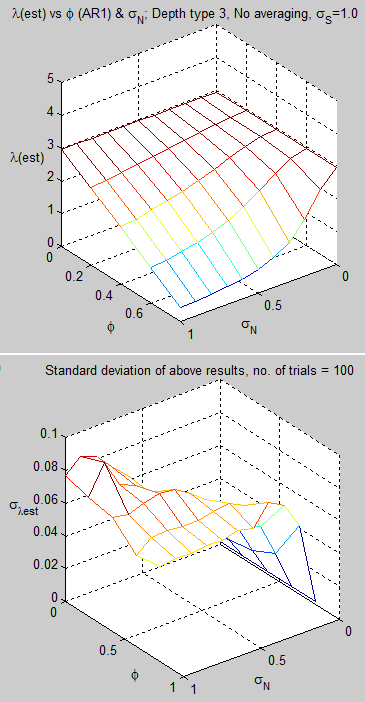 So we appear to have a nice tidy picture when looking at annual means, a little bit like the (article) figure 3 from Gat’s 2010 textbook. 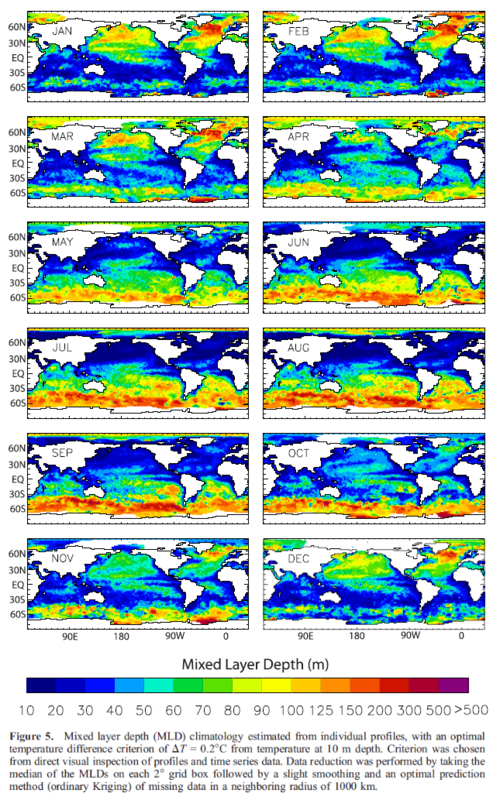 Before “muddying the waters” a little, let’s have a quick look at ocean values. If we do a quick back of the envelope calculation, using the fact that the sea level change between the last glacial maximum (LGM) and the current interglacial was about 120m, the average ocean depth is 3680m we expect a glacial-interglacial change in the ocean of about 1.5 ‰. This is why the foraminifera near the bottom of the ocean, capturing 18O from the ocean, are recording ice volume, whereas the ice cores are recording atmospheric temperatures. Note as well that during the glacial, with more ice locked up in ice sheets, the value of ocean δ18O will be higher. So colder atmospheric temperatures relate to lower values of δ18O in precipitation, but – due to the increase in ice, depleted in 18O – higher values of ocean δ18O. 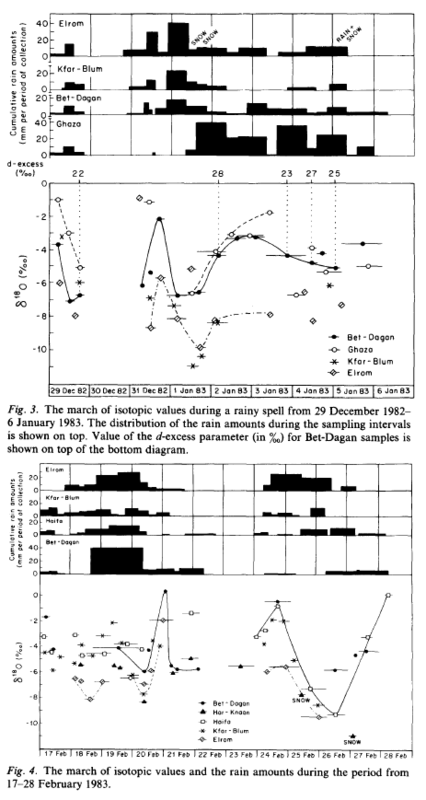 The first detailed evaluation of the equilibrium and nonequilibrium factors that determine the isotopic composition of precipitation was published by Dansgaard (1964). 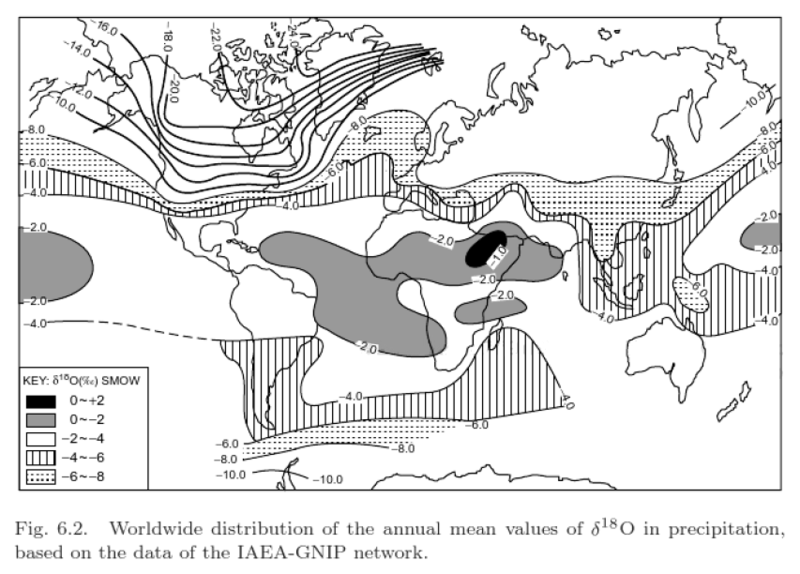 He demonstrated that the observed geographic distribution in isotope composition is related to a number of environmental parameters that characterize a given sampling site, such as latitude, altitude, distance to the coast, amount of precipitation, and surface air temperature. Out of these, two factors are of special significance: temperature and the amount of precipitation. 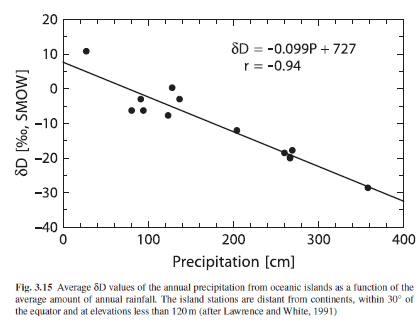 The best temperature correlation is observed in continental regions nearer to the poles, whereas the correlation with amount of rainfall is most pronounced in tropical regions as shown in Fig. 3.15. The apparent link between local surface air temperature and the isotope composition of precipitation is of special interest mainly because of the potential importance of stable isotopes as palaeoclimatic indicators. The amount effect is ascribed to gradual saturation of air below the cloud, which diminishes any shift to higher δ18O-values caused by evaporation during precipitation. The points that Hoefs make indicate some of the problems relating to using δ18O as the temperature proxy. We have competing influences that depend on the source and journey of the air parcel responsible for the precipitation. What if circulation changes? For readers who have followed the past discussions here on water vapor (e.g., see Clouds & Water Vapor – Part Two) this is a similar kind of story. With water vapor, there is a very clear relationship between ocean temperature and absolute humidity, so long as we consider the boundary layer. But what happens when the air rises high above that – then the amount of water vapor at any location in the atmosphere is dependent on the past journey of air, and as a result the amount of water vapor in the atmosphere depends on large scale circulation and large scale circulation changes. The same question arises with isotopes and precipitation. In Greenland there are significant differences between temperature records from the East coast and the West coast which are still evident in 30 yr smoothed records. The isotopic records from the interior of Greenland do not appear to follow consistently the temperature variations recorded at either the east coast or the west coast.. 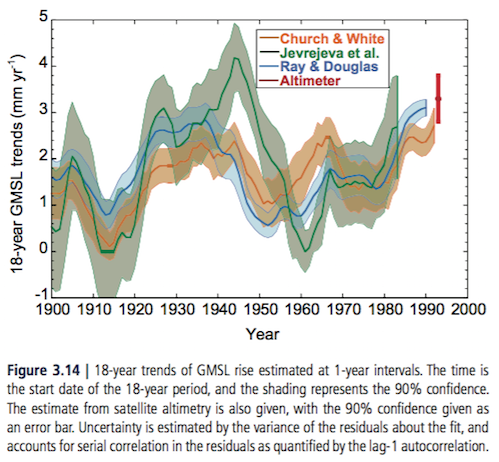 This behavior may reflect the alternating modes of the North Atlantic Oscillation.. They [simple models] are, however, limited to the study of idealized clouds and cannot account for the complexity of large convective systems, such as those occurring in tropical and equatorial regions. Despite such limitations, simple isotopic models are appropriate to explain the main characteristics of dD and d18O in precipitation, at least in middle and high latitudes where the precipitation is not predominantly produced by large convective systems. Indeed, their ability to correctly simulate the present-day temperature-isotope relationships in those regions has been the main justification of the standard practice of using the present day spatial slope to interpret the isotopic data in terms of records of past temperature changes. Notice that, at least for Antarctica, data and simple models agree only with respect to the temperature of formation of the precipitation, estimated by the temperature just above the inversion layer, and not with respect to the surface temperature, which owing to a strong inversion is much lower.. Thus one can easily see that using the spatial slope as a surrogate of the temporal slope strictly holds true only if the characteristics of the source have remained constant through time. If all the precipitation occurs during warm summer months, for example, the “annual δ18O” will naturally reflect a temperature warmer than Ts [annual mean].. If major changes in seasonality occur between climates, such as a shift from summer-dominated to winter- dominated precipitation, the impact on the isotope signal could be large..it is the temperature during the precipitation events that is imprinted in the isotopic signal. Second, the formation of an inversion layer of cold air up to several hundred meters thick over polar ice sheets makes the temperature of formation of precipitation warmer than the temperature at the surface of the ice sheet. Inversion forms under a clear sky.. but even in winter it is destroyed rapidly if thick cloud moves over a site..
As a consequence of precipitation intermittancy and of the existence of an inversion layer, the isotope record is only a discrete and biased sampling of the surface temperature and even of the temperature at the atmospheric level where the precipitation forms. Current interpretation of paleodata implicitly assumes that this bias is not affected by climate change itself. Now onto the oceans, surely much simpler, given the massive well-mixed reservoir of 18O? ..Because he [Shackleton] analyzed benthonic, instead of planktonic, species he could assume minimal temperature change (limited by the freezing point of deep-ocean water). 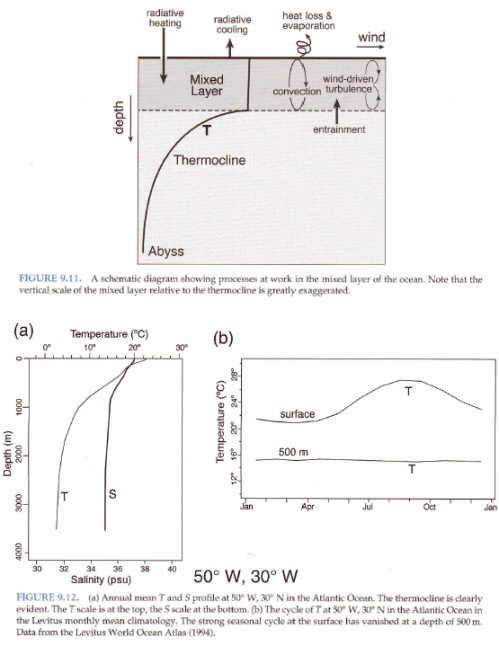 Using this constraint, he inferred that most of the oxygen-isotope signal in foraminifera must be caused by changes in the isotopic composition of seawater related to changing ice volume, that temperature changes are a secondary effect, and that the isotopic composition of mean glacier ice must have been about -30 ‰. 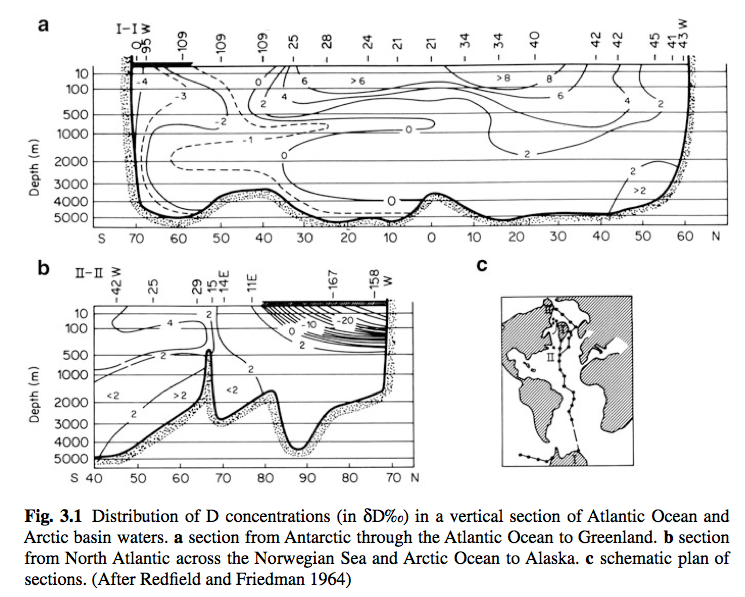 ..Although Shackleton’s interpretation of the benthonic isotope record as an ice-volume/sea- level proxy is widely quoted, there is considerable disagreement between ice-volume and sea- level estimates based on δ18O and those based on direct indicators of local sea level. A change in δ18O of 1.6‰ at δ(ice) = – 35‰ suggests a sea-level change of 165 m. ..In addition, the effect of deep-ocean temperature changes on benthonic isotope records is not well constrained. Benthonic δ18O curves with amplitudes up to 2.2 ‰ exist (Shackleton, 1977; Duplessy et al., 1980; Ruddiman and McIntyre, 1981) which seem to require both large ice- volume and temperature effects for their explanation. Many other heavyweights in the field have explained similar problems. We will return to both of these questions in the next article. Understanding the basics of isotopic changes in water and water vapor is essential to understand the main proxies for past temperatures and past ice volumes. Previously we have looked at problems relating to dating of the proxies, in this article we have looked at the proxies themselves. There is good evidence that current values of isotopes in precipitation and ocean values give us a consistent picture that we can largely understand. The question about the past is more problematic. I started looking seriously at proxies as a means to perhaps understand the discrepancies for key dates of ice age terminations between radiometric dating and ocean cores (see Thirteen – Terminator II). Sometimes the more you know, the less you understand.. 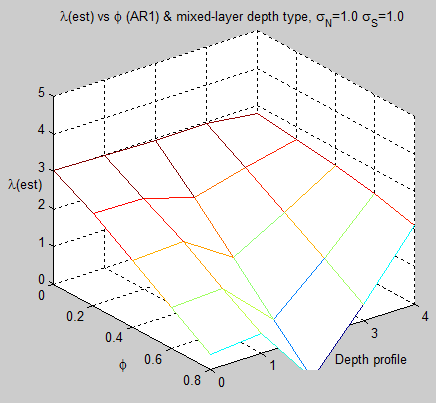 Note 1: There is a relationship between δ18O and δD which is linked to the difference in vapor pressures between H2O and HDO in one case and H216O and H218O in the other case. δD = 8 δ18O + 10 – known as the Global Meteoric Water Line. The equation is more of a guide and real values vary sufficiently that I’m not really clear about its value. There are lengthy discussions of it and the variations from it in Ferronsky & Polyakov. How do the atmosphere and ocean exchange oxygen? In essence, photosynthesis turns sunlight + water (H2O) + carbon dioxide (CO2) –> sugar + oxygen (O2). 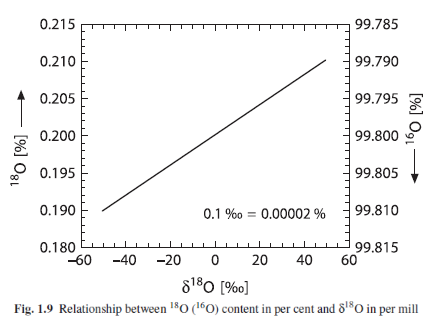 The isotopic composition of the water in photosynthesis affects the resulting isotopic composition in the atmospheric oxygen. The reason the Dole effect exists is well understood, but the reason why the value comes out at 23.5‰ is still under investigation. This is because the result is the global aggregate of lots of different processes. So we might understand the individual processes quite well, but that doesn’t mean the global value can be calculated accurately. It is also the case that δ18O of atmospheric O2 has varied in the past – as revealed first of all in the Vostok ice core from Antarctica. Michael Bender and his colleagues had a go at calculating the value from first principles in 1994. As they explain (see below), although it might seem as though their result is quite close to the actual number it is not a very successful result at all. Basically due to the essential process you start at 20‰ and should get to 23.5‰, but they o to 20.8‰. The δ18O of O2.. reflects the global responses of the land and marine biospheres to climate change, albeit in a complex manner.. The magnitude of the Dole effect mainly reflects the isotopic composition of O2 produced by marine and terrestrial photosynthesis, as well as the extent to while the heavy isotope is discriminated against during respiration..
..Over the time period of interest here, photosynthesis and respiration are the most important reactions producing and consuming O2. The isotopic composition of O2 in air must therefore be understood in terms of isotope fractionation associated with these reactions. The δ18O of O2 produced by photosynthesis is similar to that of the source water. The δ18O of O2 produced by marine plants is thus 0‰. The δ18O of O2 produced on the continents has been estimated to lie between +4 and +8‰. These elevated δ18O values are the result of elevated leaf water δ18O values resulting from evapotranspiration. ..The calculated value for the Dole effect is then the productivity-weighted values of the terrestrial and marine Dole effects minus the stratospheric diminution: +20.8‰. This value is considerably less than observed (23.5‰). The difference between the expected value and the observed value reflects errors in our estimates and, conceivably, unrecognized processes. Why has the Dole effect been so constant? Answering this question is impossible at the present time, but we can probably recognize the key influences..
Our ability to explain the magnitude of the contemporary Dole effect is a measure of our understanding of the global cycles of oxygen and water. A variety of recent studies have improved our understanding of many of the principles governing oxygen isotope fractionation during photosynthesis and respiration.. However, our attempt to quantitively account for the Dole effect in terms of these principles was not very successful.. The agreement is considerably worse than it might appear given the fact that respiratory isotope fractionation alone must account for ~20‰ of the stationary enrichment of the 18O of O2 compared with seawater..
..[On the Vostok record] Our results show that variation in the Dole effect have been relatively small during most of the last glacial-interglacial cycle. 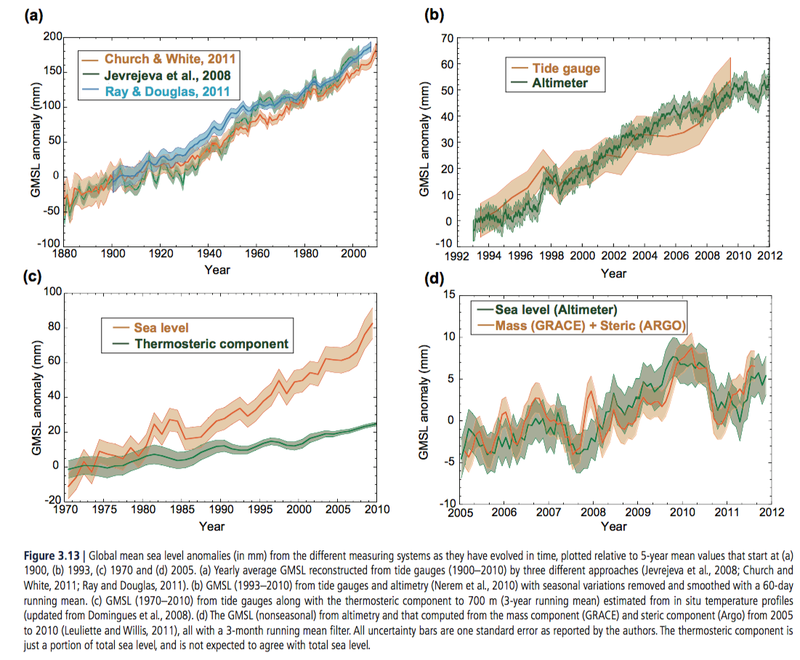 These small changes are not consistent with large glacial increases in global oceanic productivity. The Earth’s Dole effect describes the isotopic 18O/16O-enrichment of atmospheric oxygen with respect to ocean water, amounting under today’s conditions to 23.5‰. We have developed a model of the Earth’s Dole effect by combining the results of three- dimensional models of the oceanic and terrestrial carbon and oxygen cycles with results of atmospheric general circulation models (AGCMs) with built-in water isotope diagnostics. We obtain a range from 22.4‰ to 23.3‰ for the isotopic enrichment of atmospheric oxygen. We estimate a stronger contribution to the global Dole effect by the terrestrial relative to the marine biosphere in contrast to previous studies. This is primarily caused by a modeled high leaf water enrichment of 5–6‰. Leaf water enrichment rises by ~1‰ to 6–7‰ when we use it to fit the observed 23.5‰ of the global Dole effect. Based on the new information on the biogeochemical mechanisms involved in the global oxygen cycle, as well as new and more precise experimental data on oxygen isotopic fractionation in various processes obtained over the last 15 years, we have reevaluated the components of the Dole effect.Our new observations on marine oxygen isotope effects, as well as, new findings on photosynthetic fractionation by marine organisms lead to the important conclusion that the marine, terrestrial and the global Dole effects are of similar magnitudes. This result allows answering a long‐standing unresolved question on why the magnitude of the Dole effect of the last glacial maximum is so similar to the present value despite enormous environmental differences between the two periods. The answer is simple: if DEmar [marine Dole effect] and DEterr [terrestrial Dole effect] are similar, there is no reason to expect considerable variations in the magnitude of the Dole effect as the result of variations in the ratio terrestrial to marine O2 production. Finally, the widely accepted view that the magnitude of the Dole effect is controlled by the ratio of land‐to‐sea productivity must be changed. Instead of the land‐sea control, past variations in the Dole effect are more likely the result of changes in low‐latitude hydrology and, perhaps, in structure of marine phytoplankton communities. Under equilibrium conditions at 25ºC, the fractionation factors for evaporating water are 1.0092 for 18O and 1.074 for D. However under natural conditions, the actual isotopic composition of water is more negative than the predicted equilibrium values due to kinetic effects. The discussion of kinetic effects gets a little involved and I don’t think is really necessary to understand – the values of isotopic fractionation during evaporation and condensation are well understood. The confounding factors around what the proxies really measure relate to the journey (i.e. temperature history) and mixing of the various air parcels as well as the temperature of air relating to the precipitation event – is the surface temperature, the inversion temperature, both? In the ensuing discussion on Does Back Radiation “Heat” the Ocean? – Part Four, the subject of the cool skin of the ocean surface came up a number of times. It’s not a simple subject, but it’s an interesting one so I’m going to plough on with it anyway. The ocean surface is typically something like 0.1°C – 0.6°C cooler than the temperature just below the surface. And this “skin”, or ultra-thin region, is less than a 1mm thick. 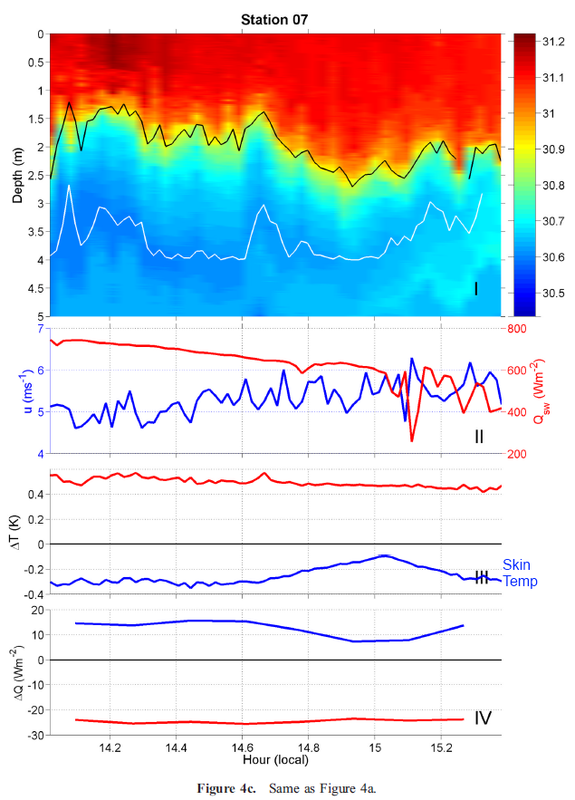 There is a lot of interest in this subject because of the question: “When we say ‘sea surface temperature’ what do we actually mean?“. 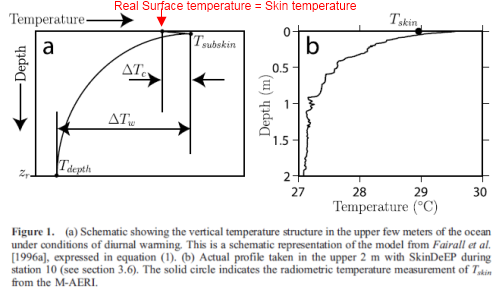 As many climate scientists note in their papers, the relevant sea surface temperature for heat transfer between ocean and atmosphere is the very surface, the skin temperature. In figure 1 you can see that during the day the temperature increases up to the surface and then, in the skin layer, reduces again. Note that the vertical axis is a logarithmic scale. 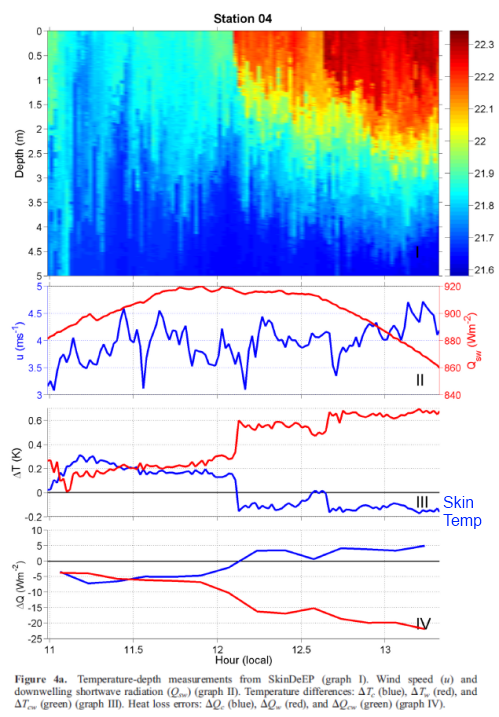 Then at night the temperature below the skin layer is mostly all at the same temperature (isothermal). This is because the surface cools rapidly at night, and therefore becomes cooler than the water below, so sinks. This diurnal mixing can also be seen in some graphs I posted in the comments of Does Back Radiation “Heat” the Ocean? – Part Four. Note: The red text and arrow is mine, to draw attention to the lower skin temperature. The measurements on the right were taken just before midday “local solar time”. I.e., just before the sun was highest in the sky. And in the measurements below I’ve made it a bit easier to pick out the skin temperature difference with blue text “Skin temp“. 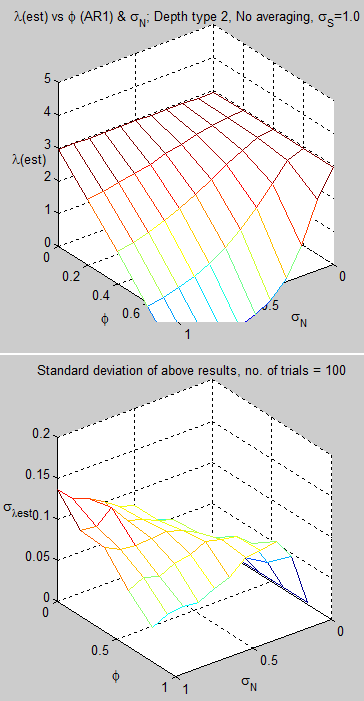 The blue value in each graph is what is identified as ΔTc in the schematic above. The time is shown as local solar time. The measurements of the skin surface temperature were made by MAERI, a passive infrared radiometric interferometer. 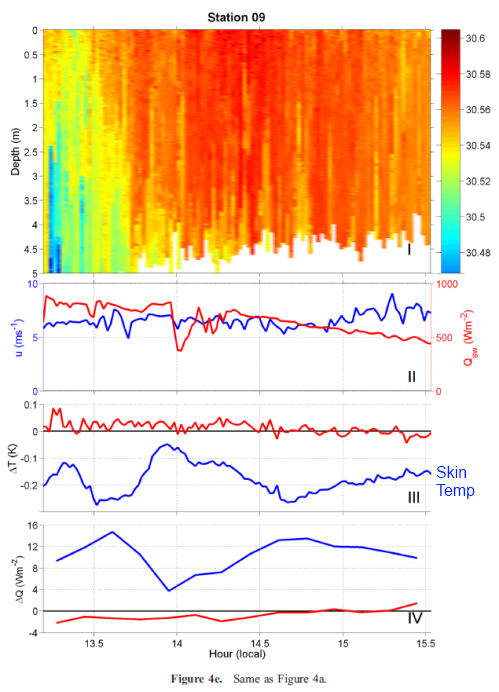 The accuracy of the derived SSTs from M-AERI is better than 0.05 K.
Below the skin, the high-resolution temperature measurements were measured by SkinDeEP, an autonomous vertical profiler. 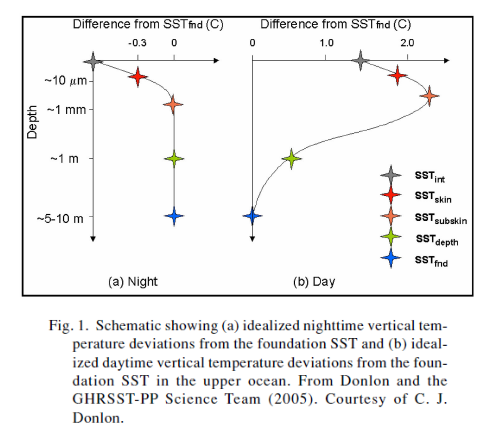 This includes the “sub-skin” measurement, from which the sea surface temperature was subtracted to calculate ΔTc (see figure 1). The existence of the temperature gradient is explained by the way heat is transferred: within the bulk waters, heat transfer occurs due to turbulence, but as the surface is approached, viscous forces dominate and molecular processes prevail. 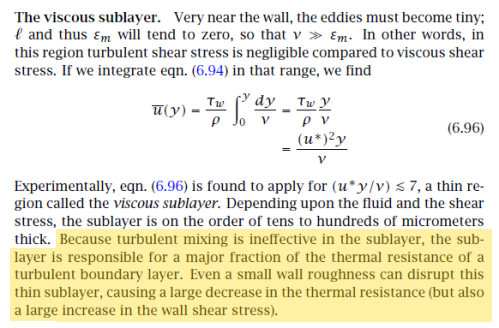 Because heat transfer by molecular conduction is less efficient than by turbulence, a strong temperature gradient is established across the boundary layer. Away from the interface the temperature gradient is quickly destroyed by turbulent mixing. Thus the cool-skin temperature change is confined to a region of thickness, which is referred to as the molecular sublayer. 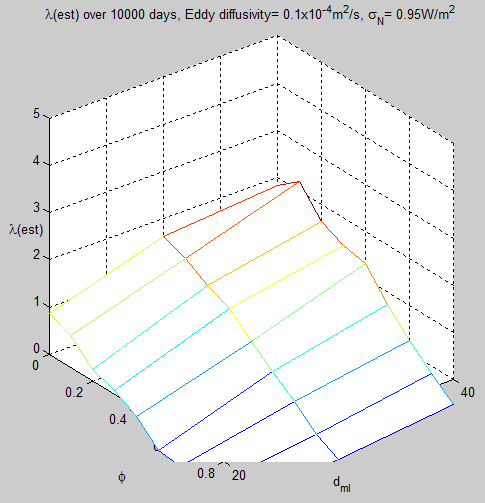 The idea behind turbulent mixing in fluids is that larger eddies “spawn” smaller eddies, which in turn spawn yet smaller eddies until you are up against an interface for that fluid (or until energy is dissipated by other effects). In the atmosphere, for example, large scale turbulence moves energy across many 100’s of kilometers. A few tens of meters above the ground you might measure eddies of a few hundreds of meters in size, and in the last meter above the ground, eddies might be measured in cms or meters, if they exist at all. 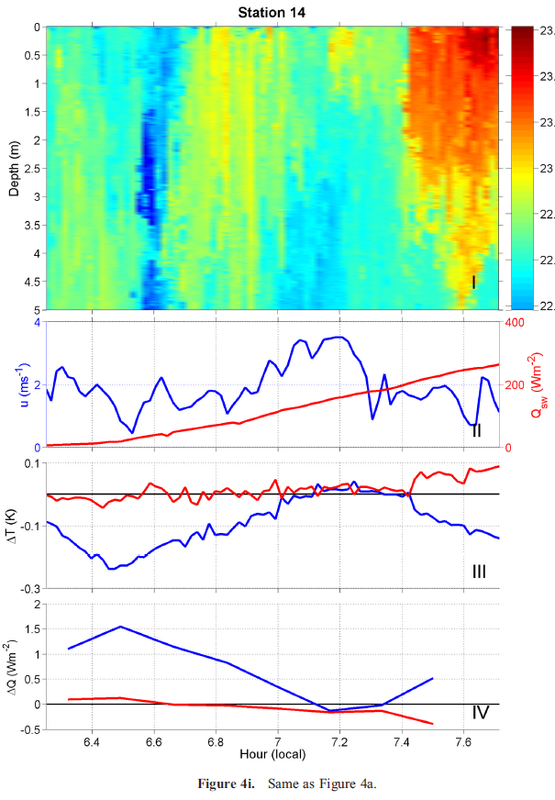 And by the time we measure the fluid flow 1mm from the ground there is almost no turbulence. For some basic background over related terms, check out Heat Transfer Basics – Convection – Part One, with some examples of fluid flowing over flat plates, boundary layers, laminar flow and turbulent flow. Therefore, very close to a boundary the turbulent effects effectively disappear, and heat transfer is carried out via conduction. 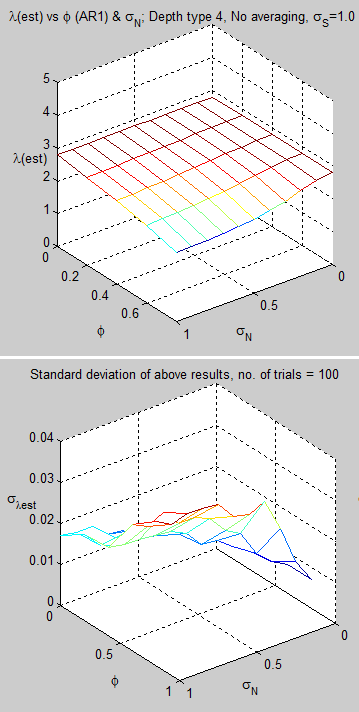 Generally conduction is less effective than turbulence movement of fluids at heat transfer. The less effectively heat can move through a body, the higher the temperature differential needed to “drive” that heat through. Now during the day a significant amount of heat moves up through the ocean to the surface. 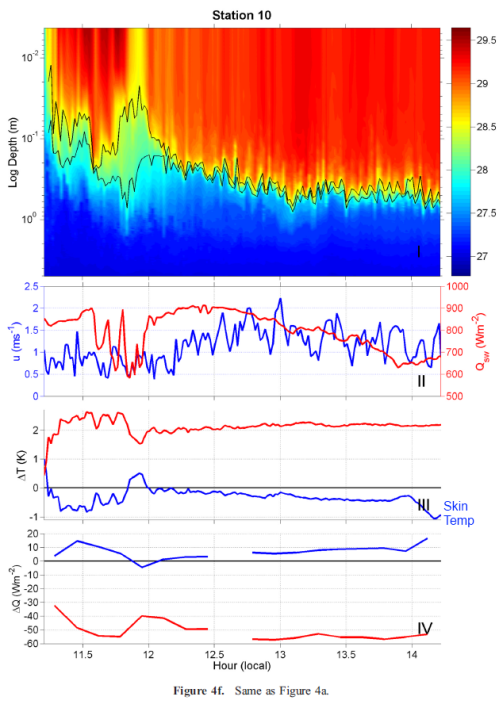 This is the solar radiation absorbed below the surface. Near the surface where turbulent mixing reduces in effectiveness we should expect to see a larger temperature gradient. 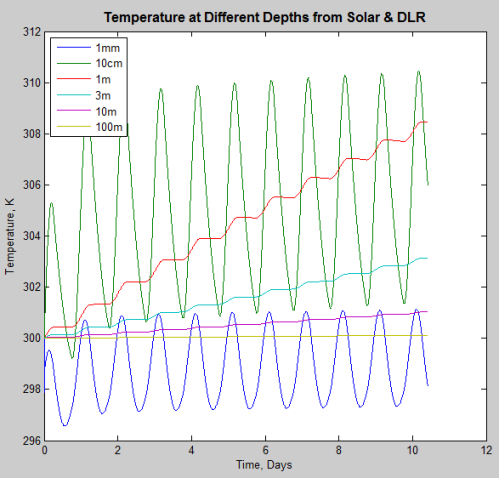 Taking the example of 1m down, if for some reason heat was not able to move effectively from 1m to the surface, then the absorbed solar radiation would keep heating the 1m depth and its temperature would keep rising. Eventually this temperature gradient would cause greater heat flow. Note how the 1m & 3m depth keep increasing in temperature. See that article for more explanation. If the temperature increases closer to the surface, why does it “change direction” in the last millimeter? In brief, the temperature generally rises in the last few meters as you get closer to the surface because hotter fluids rise. They rise because they are less dense. So why doesn’t that continue to the very last micron? The surface is where (almost) all of absorbed ocean energy is transferred to the atmosphere. Radiation from the surface takes place from the top few microns. 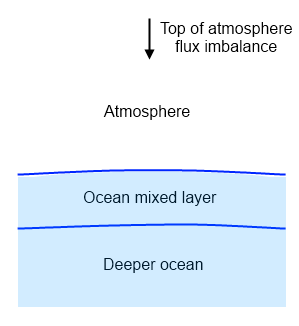 Latent heat – evaporation of water into water vapor – is taken from the very top layer of the ocean. And in general the ocean is moving heat into the atmosphere, rather than the reverse. The atmosphere is usually a few degrees cooler than the ocean surface. Because turbulent motion is reduced the closer we get to the boundary with the atmosphere, this means that conduction is needed to transfer heat. This needs a temperature differential. I could write it another way – because “needing a temperature differential” isn’t the same as “getting a temperature differential”. If the heat flow up from below cannot get through to the surface, the energy will keep “piling up” and, therefore, keep increasing the temperature. Eventually the temperature will be high enough to “drive the heat” out to the surface. 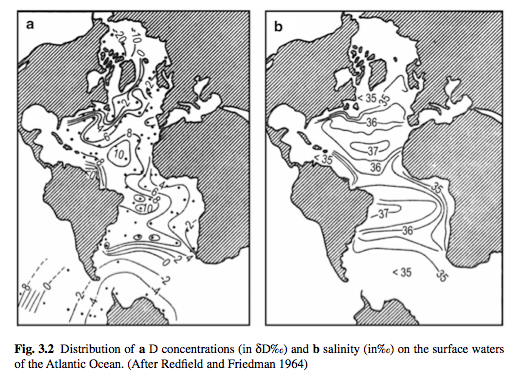 We saw a simple 1-d model in Does Back Radiation “Heat” the Ocean? – Part Four. 1. 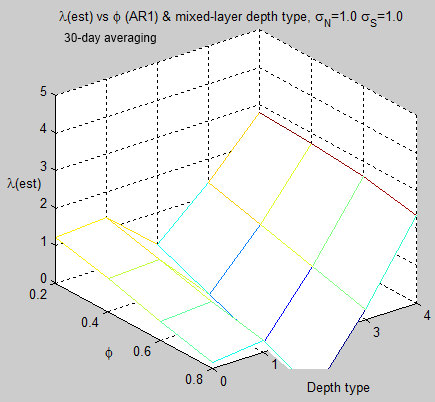 Increased the granularity of the model – with depths for each layer of: 100μm, 300μm, 1mm, 5mm, 20mm, 50mm, 200mm, 1m, 10m, 100m (note values are the lower edge of each layer). 2. 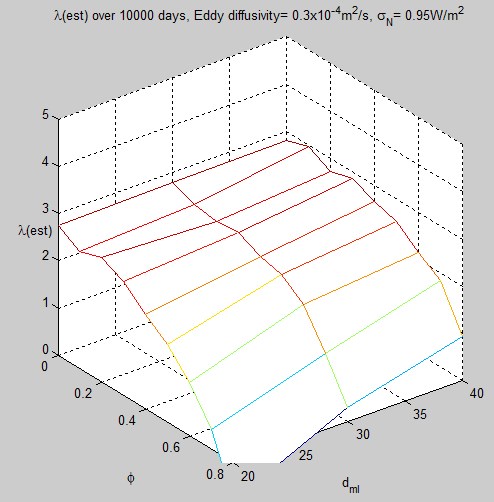 Reduced the “turbulent conductivity” values as the surface was reached – instead of one “turbulent conductivity” value (used when the layer below was warmer than the layer above), these values were reduced closer to the surface, e.g. for the 100μm layer, kt=10; for the 300μm layer, kt=10; for the 1mm layer, kt=100; for the 5mm layer, kt=1000; for the 20mm layer, kt=100,000. Then the rest were 200,000 = 2×105 – the standard value used in the earlier models. 3. Reduced the time step to 5ms. This is necessary to make the model work and of course does reduce the length of run significantly. The results for a 30 day run showed the beginnings of a cooler skin. And the starting temperatures for the top layer down to the 20mm layer were the same. The values of kt were not “tuned” to make the model work, I just threw some values in to see what happened. As a side note for those following the discussion from Part Four, the ocean temperature also increased for DLR increases with these changes. Now I can run it for longer but the real issue is that the model is not anywhere near complex enough. There are some papers for people who want to follow this subject further. This is not a “literature review”, just some papers I found on the journey. The subject is not simple. 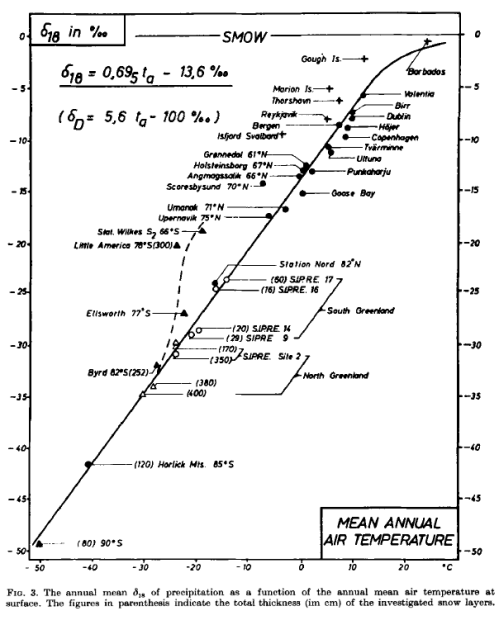 Saunders, Peter M. (1967), The Temperature at the Ocean-Air Interface, J. Atmos. Sci. 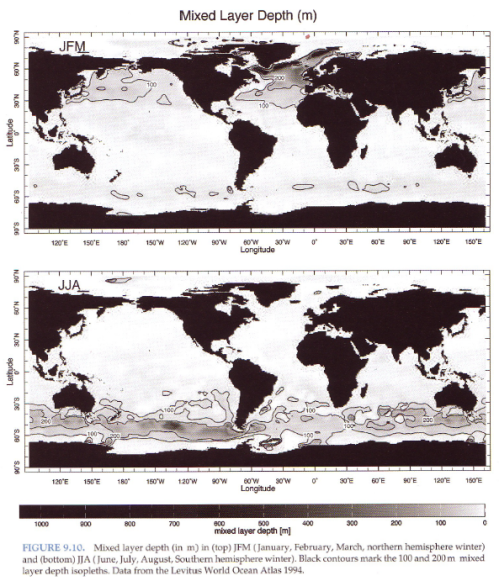 McAlister, E. D., and W. McLeish (1969), Heat Transfer in the Top Millimeter of the Ocean, J. Geophys. Res. Generally speaking, the structure of the viscous layer is known to be related to the molecular viscosity, surface winds, and air-sea flux exchanges. Both Saunders’ formulation [Saunders, 1967; Grassl, 1976; Fairall et al.,1996] and the renewal theory [Liu et al., 1979; Wick et al.,1996; Castro et al., 2003; Horrocks et al., 2003] have been developed and applied to study the cool-skin effect. But the exact factors and processes determining the structure is still not well known. However, despite the complexity, an understanding of the basics helps to give some insight into why the temperature profile is like it is. I welcome commenters who can make the subject easier to understand. And also commenters who can explain the more complex elements of this subject.